The last show for the night on New York Fashion Week Fall 2009 Day 4 was William Rast at the Bryant Park Tent. It was surely a star studded show, before the show started I had time to kill so I headed backstage and spotted Coco Rocha taking a photo with Anna Wintour! Sitting front row that I spotted was Anna Wintour and Bee Shaffer, Jessica Biel (of course), Paris and Nicky Hilton, Aubrey O’Day, Coco Rocha, Sarah Colette, Aisha Tyler and Anthony Anderson. Surprisingly the show started on time with a full house, Justin Timberlake’s latest William Rast collection features a “New America”look. This collection is made up of the American denim look and biker culture, full of denim jeans, skirts, jackets, vintage tees and plaid shirts with big shoulder pads and leather biker jackets with shoulder pads, embellishments, fringes and patch working coupled with studs and badges. There are a few pieces I’m liking, the mix of denim and leather in one piece is quite nice. The Nylon Magazine x Nike Sportswear Dunk High kicks are really making it’s round during New York Fashion Week. The first pair we spotted was a yellow pair outside of Donna Karan. Last night at the Erin Wasson x RVCA Fall 2009 Collection presentation we spotted someone rockin’ a green pair. This time we can officially confirm that the letters on the kicks do spell out “NYLON”. This time it wasn’t a “cool girl” that was in the Dunks but a “cool guy”. 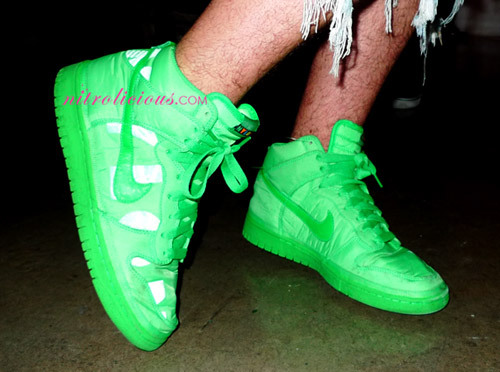 Are you lovin’ these Dunks so far, which color do you prefer- pink, green or yellow? The Dunks won’t be available until June 2009, but further details will be available in Nylon’s April issue. We return to the daily review of the new campaigns that hope for the next spring-summer 2009. In this case we give a 360 degree turn after the last, where we saw the kind of a signature as photographed by Mario Testino Burberry and go to New York, where the protagonist today: DKNY Jeans. The firm will have to dodge the criticism he is receiving his mark from the mother organization PETA, despite DKNY Jeans is intended for an audience is completely different and more informal, without the use of fur in their designs. Rather, only denim. If you’re talking about Scott Schuman many wonder who he is, but if you are The Sartorialist said the vast majority comes to image the revolution made by the photographer with his blog. DKNY Jeans to give such a dynamic and fresh air to his campaign and make it move closer to the general public, it has enjoyed for the next season Schuman. Thus we see models represented in the middle of the streets of New York all celebrities including names such as Sean Lennon, Daisy Lowe, DJ Coleman, Worrell Luc and Chanel Iman. What I mean is not yet under that have decided to add the individual photographs, which fade and blend the blue and red of the brand and the name underneath. The result is that a horterada Schuman afea photos but will wait to see it in person in February. If there are stars for which follow the passage, is a Victoria Bekham, and I do not mean it is a monument worthy of imitating, but because his body looks like the frame of a normal woman, of flesh and blood, but sometimes overdo with their diet and look like real corpse. In the photos of Victoria for Armani, Victoria can be seen lying on a bed and the floor, displaying collections of underwear, which show in detail what its curved body. The photos have not been free from controversy, and is said to have been retouched with Photoshop to erase the stains of the skin or make it look more voluptuous, but in essence, who argue that in beautiful Victoria, “I am sure that despite their physical defects, no one. Is the date for Valentine’s Day and more and more women wanting to enhance their love and their excitement with your partner, so that more and more spells and rituals for February 14. But the question is always the same among the ladies who wait until February 14 to celebrate their spells looking for true love. Although How does that really get your partner is secure? or How do I get to draw the attention of the man you want? All these questions and some more, when comeinces to solve our lleer post with the best tricks and spells to carry out the Valentine’s night. This is one of the most spells followed by thousands of women who seek a secure and more passionate commitment sentimental. Encesarios ingredients are: 3 red candles, a plate blac, cinnamon and honey. Would you include a trip to the local Oxfam in your weekend shopping itinerary? Many of us are happy to donate unwanted bits to a charity shop, but wouldn’t dream of trawling its rails for a bargain. Alongside an irrational phobia of second-hand clothes, the most common complaints are that the shops are too jumbled and it takes too long to find anything worth having. They’re okay for students, but for people with real jobs, it simply isn’t practical, goes the thinking. Oxfam wants to change this perception. Its latest campaign, Sustain Me, supported by celebrities as diverse as Jourdan Dunn, Jaime Winstone, Cat Deeley and Honor Blackman, all posing here in Oxfam finery, is all about persuading us that charity shopping is cool, not merely for fashion students, stylists and creative types, who have long used them for inspiration, but for everybody. Runway:Yellow, pink and blue brightened runways around the globe. Even animal prints got a bright update at Cavalli and Lanvin. Reality: The official “It” color of Spring 2009 is yellow, and it’s available in everything from a greenish-yellow hue to schoolbus yellow. Although there are plenty of separates and dresses in this sunny hue, the easiest way to wear bright yellow is to pick it up in bags, like at Marc Jacobs, or other accessories. You’re better off choosing a bright that flatters your coloring (blues and pinks are often easiest) than just choosing what’s hot (like bright yellow). The green carpet again promises to bring together the best and well-established actors and actresses of our national scene in the movie Goya Awards 2009. Our latest dressed actresses, glamor and elegance off with accessories, jewelry and shoes vertigo. Although cold, the rain (and some snow) in the surroundings are not the best temperatures to look modelitos to this day one has to suffer a little and resist temperatures to be lower Madrid guapa. And that is what the artists did. One of the early birds to come to the party was Goya Toledo, who was with a beautiful gold dress that emphasized her already stylish figure with hair collected and jewelry to match the dress. It also came before the president of the Academy, Angeles Gonzalez-Sinde, always looking for innovative and original models for the ceremony. This time we saw a dress with striped black and purple of the designers Devotta & Lomba.